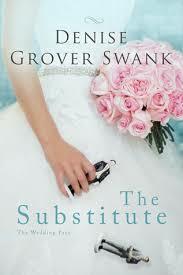 This is the first book in The Wedding Pact Series by the USA Today bestselling author Denise Grover Swank. Denise has done a wonderful job with the character depiction of Megan who is unable to face her mother, her mother Nicole (a.k.a Knickers) who is a combination of a stepford wife and Hitler and lastly Megan's two friends Blair and Libby who are both poles apart in nature. Megan's grandmother brings wonderful laughs to the story with her eccentric and fun loving behavior. Denise deserves recognition for her well written situations and good story. Megan Vandemeer who recently broke up with her cheating boyfriend is on her way home to her wedding, six weeks later, to break the news to her parents of her ended engagement. On the plane intoxicated by the dangerous combination of a couple of mimosas and two Dramamine, she meets a strong and handsome stranger to whom she tells her sad story. Josh McMillan, is one to always plan his every move, however he takes a rash decision and jumps on a plane to Kansas City to make one final attempt to save his company. He least expected to be sitting next to this gorgeous women who is intoxicated, but still manages to charm him. In his attempt to help her off the plane, a big misunderstanding is created where her parents believe him to be her fiance'. Much to his surprise, this misunderstanding might be the answer to save his business. Josh then steps in as Megan's substitute groom and through all the festivities, their relationship begins to turn from a fake to real one.